"This dog IS the standard!" proclaimed one breeder judge and we feel the same way! "Jag" was a slow to mature puppy who showed us much promise early on. He finished his Championship easily and has FIVE Specialty Best in Shows; Norwegian Elkhound Association of Minnesota Specialty from the classes over 20+ Chs. Under English breeder Pam Mead ("Thunor"), Norwegian Elkhound Club of Greater Milwaukee Specialty under master-breeder Lana Hall ("Rikkana"), Northeastern Illinois Norwegian Elkhound Association Specialty under Cam LaBree ("JoCala"), Norwegian Elkhound Association of Minnesota Specialty under Tom Stanfield ("Norsib") and the Norwegian Elkhound Club of Greater Houston under Rhoda Winter Russell. 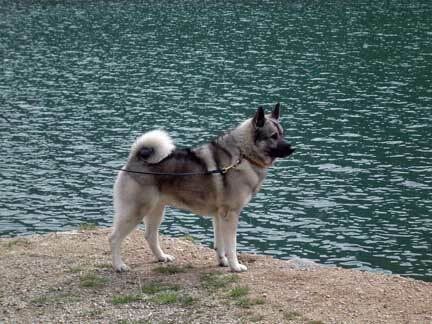 As far as Nationals go, "Jag" was the 2003 Norwegian Elkhound Association of America's National Futurity winner under Kristin Wehking ("Sangrud"), was a 2004 National Specialty Award of Merit winner under Marianne Holmli ("Pei Fang") and went BOS to kennelmate Kami at the 2005 Canadian National Specialty under English breeder Vi Nichols ("Barlestone"). He is a multiple group winner and was the 2005 Eukanuba National breed winner in Tampa, Florida. He is the sire of 3 Champions and several others pointed in limited breedings. "Jag" has been the source of many thrills and much pride for his breeders Linda Atcheson of Bermuda and KAMGAARD and his owners Linda Syner and Pam Johnson and KAMGAARD.